When a beginner attends to a class with Nagato sensei it seems that he is always repeating the same movement. When you have been training in Japan with him for over twenty years you see things differently. Nagato sensei’s movements are like a reverse Fibonacci suite*, the more he repeats the movement, and the more he is getting closer to the opponent. The Fibonacci suite looks like the shell of a snail and this is also how we should train, in slow motion. Nagato sensei taijutsu is very precise in his teaching and beginners often seem not to grasp it. He always begin the class with a movement given by one of the participants. Then he shows how to be always protected while getting closer and closer using his own precise footwork. You have to know that each one of the Japanese Shi Tennô has a particular way of moving the legs. I remember once attending a class where he was asked to demonstrate one of the kihon happô. I was training with a Japanese high rank. 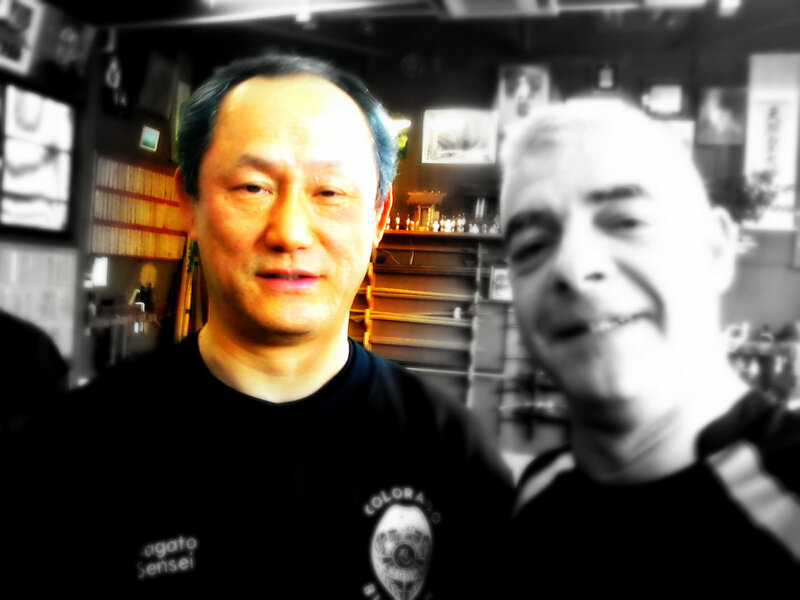 We were both regular students of Noguchi sensei at that time and our taijutsu had the “Noguchi touch”. I was the first to do the kihon happô and I was unable to do it! A kihon happô! My ego felt bad and I felt bad for my Japanese partner, thinking tat he was judging my poor level of understanding of the basics. But then when he did it, he did the same exact wrong movement I just did. That day I understood that each one of them has his own way of moving. This is why when you have the chance to come to Japan, you must train with as many shihan as possible as each one is giving you a brick to build the walls of your own house of taijutsu. Nagato sensei when teaching is not trying to show “the true technique”, he is showing how to survive an actual fight. And to do that he repeats the movements changing the distance and the angles and getting closer. This is what I call the “artichoke approach”. Each repetition is like eating the leaves of an artichoke** as gradually you are reaching the essence/heart of the technique as you would the heart of this vegetable. By adjusting slowly his footwork Nagato sensei teaches the best way to get to the core of the technique. The precision of the angles, the subtle variations in the way he holds the opponent are close to heart surgery. And he is always fully protecting himself from any reaction of his opponent. The beauty is that Nagato sensei can do that with anything demonstrated by the uke of the day, even with an apparently non interesting technique. This is the sign of a true shihan and I wish that one day I will get to this level. But this progressive adjustment is only possible if you train slowly. Forget the running rabbit attitude and learn by being slow like a snail. Everyone knows the fable of the hare and the tortoise by La Fontaine***, this is the same. When you train fast you miss the norikae (see one of my previous post) and end up using strength. The worst is that the technique you are supposed to learn is not there anymore. The beginning looks similar. The end looks similar. But the technique is absent of your movements. It is like the normal distribution in mathematics (aka Gauss curve or Bell curve****). The key element here is the center of the bell curve called “standard deviation”. When you practice like a rabbit i.e. 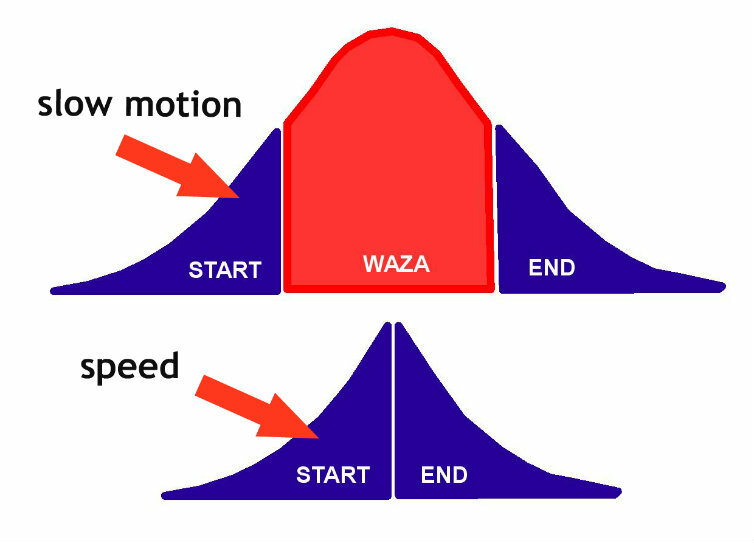 too fast the standard deviation disappears and you are left only with the omote of the technique. On the contrary, when you train like a snail you enter the ura, the heart of the waza and you can really learn. Speed in the dôjô is often the mark of a bad practitioner. Doing the movement fast is a self centered approach. You learn nothing and you can even be dangerous to your partner. Many times over the years I heard Nagato sensei stopping the class and saying “people that are moving fast are stupid!”. Space and time are connected as we know since Einstein’s theories. The slower you train, the more chance you have to “see” the kûkan. Low speed is the key to unfold the kûkan and this is what we learned again today during his class. When you train slowly your brain has enough time so that your body can understand the technique. You have to create the proper brain connections in order for your body to move without thinking. The Bujinkan is not about looking good during training with flashy visible movements made to impress our fellow practitioner. The Bujinkan is about teaching our body and mind to move correctly and this is achieved by really studying what is taught in class. You might do it differently in your own dôjô but if you came here to train, then train for real, like a snail. I leave with one sentence that hatsumi sensei said to me once: “Arnaud, train what you have to train, and teach what you have to teach”. Meditate this. If you behave like a 兔 usagi (rabbit) you will only get 有詐欺 usagi (a fraudulent existence). Thank you Nagato sensei for another enriching class, I’m drooling for our next class.